Space station commander Shane Kimbrough and French astronaut Thomas Pesquet ventured outside the lab complex Friday for the first of three spacewalks over the next two weeks to carry out routine maintenance, troubleshoot an apparent coolant leak and prepare a second docking port for use by commercial crew ferry craft. Floating in the Quest airlock module, Kimbrough and Pesquet switched their spacesuits to battery power at 7:24 a.m., officially kicking off U.S. EVA-40. After exiting the airlock, the astronauts went their separate ways, working independently at different parts of the station to carry out their tasks. Kimbrough’s first job was to replace the first of two computer relay boxes, known as multiplexer-demultiplexers, or MDMs, with an upgraded unit that can handle improved software, including data relay to and from the docking ports that are being set up for commercial crew ships. After removing the old box and installing its replacement, Kimbrough moved to the far left side of the station and disconnected four cables between the Tranquility module and a docking port tunnel known as pressurized mating adapter No. 3, or PMA-3. With the cables disconnected, flight controllers at the Johnson Space Center in Houston will use the station’s robot arm Sunday to move PMA-3 from Tranquility’s outboard hatch to the upper port of the forward Harmony module. A docking mechanism will be attached to PMA-3 around the end of the year, giving the station a second U.S. docking port for visiting Boeing and SpaceX crew ships. After disconnecting the cables to PMA-3, Kimbrough moved up the the Japanese Kibo laboratory module to replace two television cameras that had burned-out lights. Pesquet, meanwhile, started the spacewalk by moving to External Stowage Platform No. 2 where retrieved a foot restraint and a foot restraint extension. He then moved to the port 1, or P1, truss segment on the left side of the station’s main power truss to inspect ammonia coolant plumbing and hardware. Flight controllers have noticed a small leak in the coolant system and used an “ammonia sniffer” attachment on the robot arm to find the leak’s general location. At the current leak rate, the system should be able to operate normally for months, if not years, but engineers want to make sure it won’t worsen as time goes by. Pesquet, after anchoring his feet near the hardware, carried out an extensive inspection, but there were no clear signs of any leakage. Video from a GoPro camera that was held within a few inches of the hardware will be inspected later for any signs of ammonia ice flakes that might indicate a leak. After the leak inspection, Pesquet spent the rest of his time outside lubricating the capture mechanism in a hand-like device attached to the end of the station’s robot arm. Using a custom tool to reach up into the grapple mechanism, Pesquet applied grease to a variety of internal components to ensure smooth operation. Kimbrough finished his work early and completed a get-ahead task by installing a replacement light on a tool cart that moves along the lab’s power truss. When Pesquet finished the lubrication work, flight controllers told the spacewalkers to head back to the airlock and call it a day. Repressurization started at 1:58 p.m., ending a 6-hour 34-minute spacewalk, the 198th devoted to station assembly and maintenance since construction began in 1998, the third so far this year, the fifth for Kimbrough and the second for Pesquet. Total station EVA time now stands at 1,236 hours and 38 minutes, or 51.5 days. 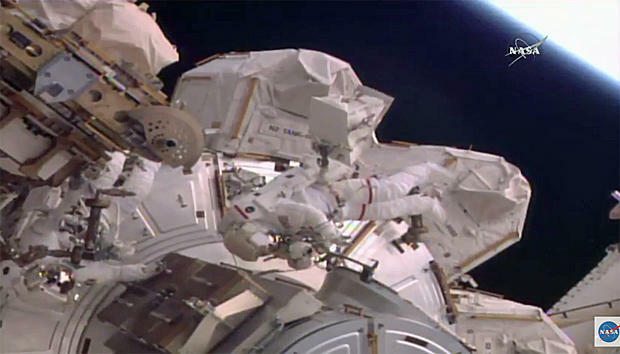 Two more spacewalks are planned between now and the end of the first week in April. EVA-41, with Kimbrough and astronaut Peggy Whitson, is planned for March 30 while EVA-42, with Whitson and Pesquet, is targeted for April 6. That spacewalk is in question, however, because Whitson and Pesquet will need equipment now packed aboard an Orbital ATK Cygnus supply ship. Launch of an Atlas 5 rocket carrying the Cygnus had been planned for Monday, but the flight is now on hold in the wake of problems with the booster’s hydraulic system. If the Atlas is delayed past the end of the month, sources say, Whitson and Pesquet likely will carry out EVA-42 in late April, after Kimbrough and his Soyuz MS-03 crewmates — vehicle commander Sergey Ryzhikov and flight engineer Andrey Borisenko — return to Earth April 10. Soyuz MS-04 commander Fyodor Yurchikhin and NASA flight engineer Jack Fischer are scheduled for launch from the Baikonur Cosmodrome in Kazakhstan on April 20. They will arrive two days later, clearing the way for EVA-42 if it has not already been carried out.